Office 365 Backups and the Opportunity that Exists for Service Providers - VIRTUALIZATION IS LIFE! In recent weeks i’ve become reacquainted with an old friend…There was a time where eighty to ninety percent of my day job was working in and around Exchange Server. If I had started this blog in 2005 it would have been dominated with posts around the Hosting of Exchange Server and probably be named Exchange is Life!. I take pride in my Hosted Exchange Org and User creation scripts that I created before Hosting Control Panels where even a thing. Over the last five or six years my interest in Exchange diminished due to moving roles and also due to some lingering ill feelings about the way in which Microsoft treated their initial Hosting partners as they started what would become, Office 365 back in the late 2000’s. That said I have remained aware of the Exchange landscape and while there is still a lot of on-premises Exchange instances and still a number of decent Hosted Exchange providers out there, there is no stopping Office 365’s growth. I even jumped on the bandwagon by moving my personal SliemaLabs domain over to an Office 365 Exchange subscription late last year. That domain initially lived on an Exchange Server I ran from home, and then on a Hosted Exchange platform I built and now it’s completed it’s own journey to Office 365. Having spent a bit of time recently looking at the 1.5 version of our Backup for Microsoft Office 365 product…more specifically the new self service feature that came in Backup & Replication 9.5 Update 3. I’ve had a renewed sense of purpose around the Exchange ecosystem…and that purpose is to ensure that all service providers understand the opportunity that exists around creating offerings for the backing up and availability of Office365 services. This post follows a post that was released on the Veeam.com blog by Paul Mattes (VP of Global Cloud Group at Veeam) talking about the success of our Backup for Microsoft Office 365 product. In 2017, more than 25,000 organizations installed our Office 365 backup solution, representing 2.3 million Microsoft Office mailboxes. We saw a staggering 327% quarter-over-quarter growth in Q4 of last year. And the reasons why all Office 365 users should consider an external backup solution for their data hosted in Microsoft’s SaaS cloud platform. It’s important to remember that SaaS platform providers, like Microsoft Office 365, take on the responsibility of application uptime and the underlying infrastructure. But it is the customer’s responsibility to manage and protect their vital business data. This is public cloud in a nutshell…Ultimately the customer has the responsibility to ensure all data is backed up correctly. I won’t go into the technical aspects as to why Office 365 requires additional backups solutions. There a plenty of good online resources, a Gartner report is available here Microsoft’s has an offical page on High Availability and Business Continuity guide. Doing research into the nature of SaaS you understand the need for third party backup solutions. From a service provider point of view there is an opportunity to tap into the 85 million user Exchange Online market and offer availability services for organisations using Office 365. This is a multi-billion dollar market that exists today and services based around backup and management of that data are central to tapping into that opportunity. Just breaking down the ANZ market alone, there are approximately 4.25 million Office 365 users of which if only 5% was captured would represent a combined 3.5 to 5 million dollar market. 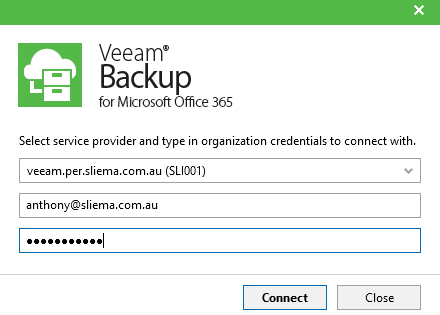 For those VCSPs who have already deployed Cloud Connect and offering Backup services, the ground work has been laid with regards to having the infrastructure in place to extend that service to offer Veeam Backup for Office 365 aaS. The billable components of this service are licenses and then storage costs. Managed Service Providers can also build in management fees that offer an end to end solution for their clients. Where it should be seen to be extremely attractive for VCPSs is in the potential for the storage revenue to be significant early and then continue to grow as tenant’s backup and retain more and more mailboxes in addition to new tenants coming on board. We have given our VCSPs the tools to be able to build a strong service around Office 365 backups with the 1.5 release of Backup for Office 365 focused on scalability and automation. Add to that the self service feature that came in Update 3 for Backup & Replication and there is no excuse to not start thinking about offering this as a service. Looking beyond Exchange Online, version 2 of Backup for Office 365 will include the ability to backup SharePoint and OneDrive as well…have a think about what that represents in terms of revenue opportunities just on the potential for storage consumption alone. Again, I want to emphasis that this market is huge and what’s on offer in terms of potential revenue can’t be ignored. I’m excited about the next 12-18 months in being able to see our VCSPs grab this opportunity…don’t let it slip!